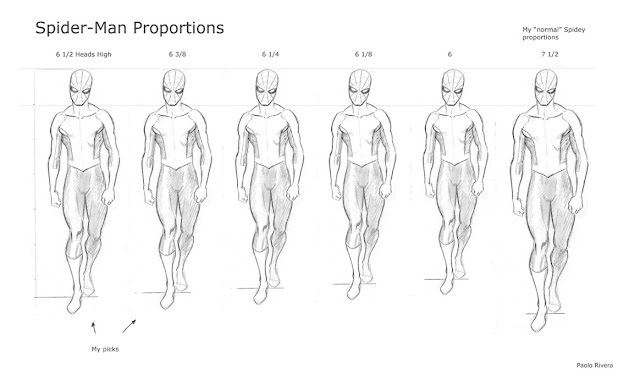 Spider-Man Proportions. 2010. Pencil on paper, digitally manipulated. I draw Spider-Man all the time (or at least I did before Daredevil), but this project was uniquely challenging — we needed to depict a younger version of Spider-Man, while still maintaining the physique of a (slightly) more mature adult. From the beginning, it seemed like the team was asking for opposing ideals: he needed to be bigger, more muscular, yet still look like he was 15 and nerdy. In order to graphically chart the challenge, I composed this diagram to compare and contrast differing proportions. 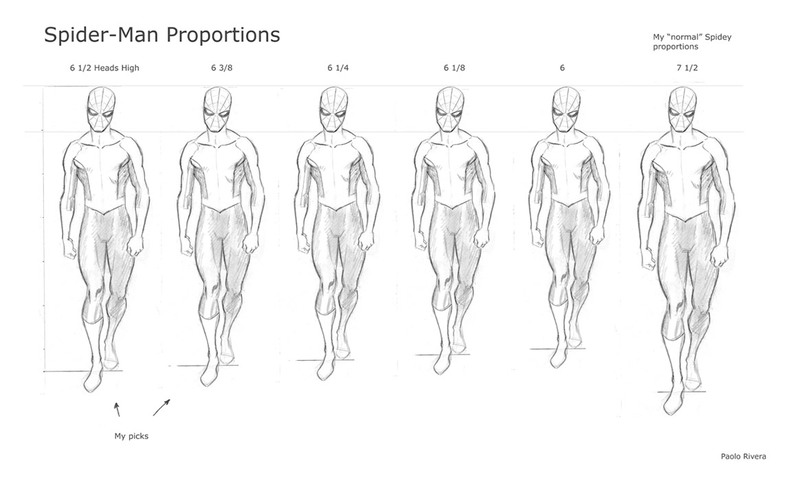 The far right figure is how I portray Spidey in most situations (though I often stretch anatomy to fit the gesture). To his immediate left is an almost laughable bobble head that served as an example to avoid. As we went back and forth in the sketch phase, I finally realized what was needed: big hands and feet. By adding that extra detail, it gave him an awkward quality that could communicate his age without taking away from his superheroic build. I'm saving my final Spidey turnarounds for next week, but tomorrow I'll reveal my character studies for Doc Ock, including some incorporated reference from Marvel Studios. And while I have your attention, I've also got a new interview with the nice folks at Thought Bubble. Interesting study. While I was reading this I wondered how I would achieve the result and I came up with the idea to look at high school and first year college basketball players. They have excellent physiques and yet still look like kids with certain body parts being disproportionate overall. I think the result is the same, big hands and feet with a muscular build achieving a slightly goofy look. That's a great approach. I keep an ever-growing reference file of nothing but athletes of all kinds. Long-jumpers and gymnasts tend to be yield the best results for me. Sorry about the blog. The comments don't seem to work in some browsers, even for me. As for proportion, it's one of the most important things in draftsmanship. The main reason I was making the head bigger was to make him look younger, as is generally the case with kids of all ages. It's tough with Spidey because you can't see his face, or any other clues as to his age. If you're having trouble with it, try drawing from life, and try drawing people of all ages. It's a lot of work, but it's worth it. Hope that helps.